Tony, Friday afternoon at regisration. Catching up with friends, lots of photos. Time flies! I met Tony at Javelina three years ago when I paced him for that race. 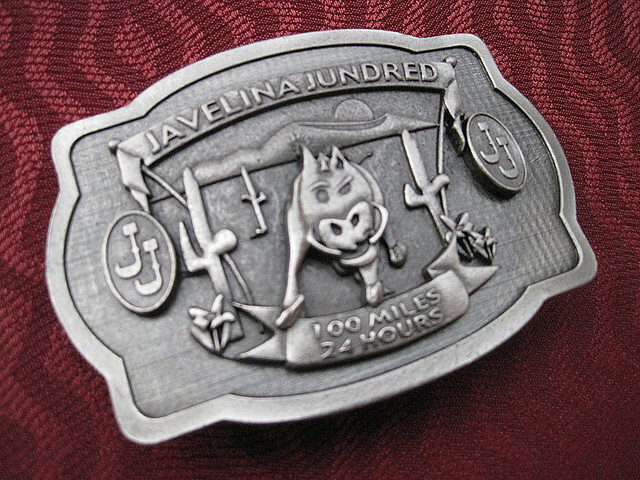 I've now paced him for five 100-milers and three of those at Javelina. So far we've not only finished but also succeeded in breaking PR's. 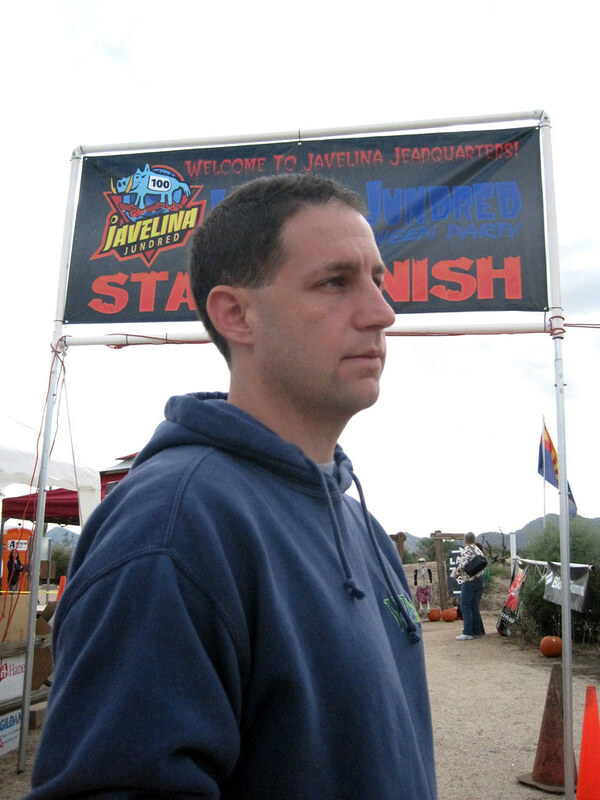 Tony finished the first Javelina despite being under-trained, he had his first sub-24 hour finish at Rocky Raccoon in 2009, clinched a course PR and 100-mile PR at Javelina later that year, had himself another 100-mile PR with a 19:26 at Umstead earlier this year and finally another course PR at Javelina this past weekend with his 22:57. His running is still on an upward trajectory with no signs of slowing down. 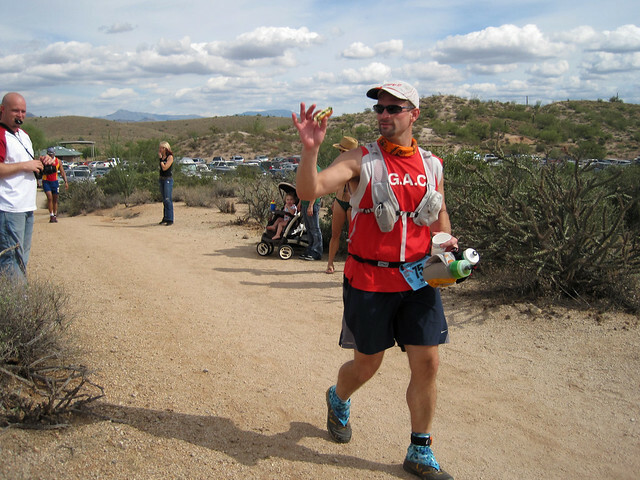 Tony has been working harder and he was coming into this event with four big races under his belt - a couple of 100 milers and a couple of 135 milers and several shorter distance ultras. The goal was to set another course PR and I was confident that he could do it. I had some concerns considering all that he had already done this year but he's not a rookie and he knows his body best. As always we reserved to make a final call after he had put in 20-30 miles on the run and had a better gauge on where his body was at. The first four laps went like clockwork. He came in over an hour ahead from last years 60-mile split and looked great. He has gotten stronger and faster. I can tell the difference since I only run with him once or twice a year. During the night he had his share of issues but the bad patches didn't last long and his surges surprised me the most - nice long sections of hard fast running the last 20 miles of the race. The last 4.7 miles, particularly from the last aid station to the finish was probably his fastest miles the entire race. Tony with Bradley Fenner at the start. 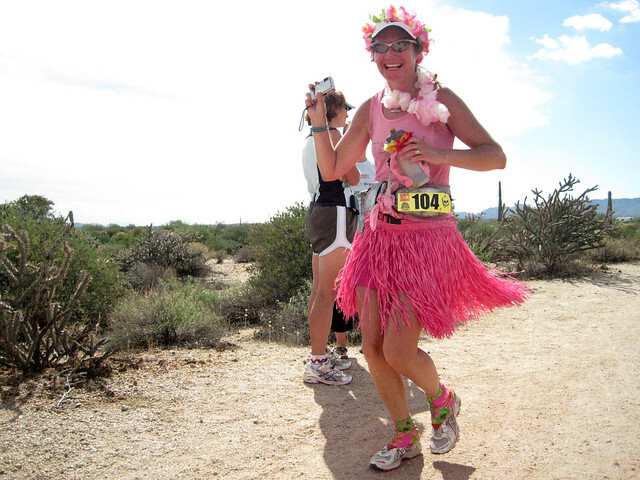 The race consists of 7 loops, six 15.4-mile loops and one 9-mile loop. The terrain is not technical nor is it particularly hilly and the aid stations are only about 5 miles apart; however there is no cover in the entire course and mid-to-high 70's feel a lot warmer. This year they were lucky, there was actually a breeze and occasional cloud cover. On paper it looks easier than the other 100 milers but the drop out rate is high every year, almost 50%. Pacers are allowed from 60 miles onward or at sunset whichever comes first. Tony is fast enough to cover the 60+ miles before the sun sets and until then it's a lot of waiting, helping Tony, helping out other friends and driving in and out of the mountain park for grub, coffee and additional supplies. It was a lot more fun this year since I had the company of Erika Lindland, a fellow bay area runner, teammate, who was also crewing. Company is good. 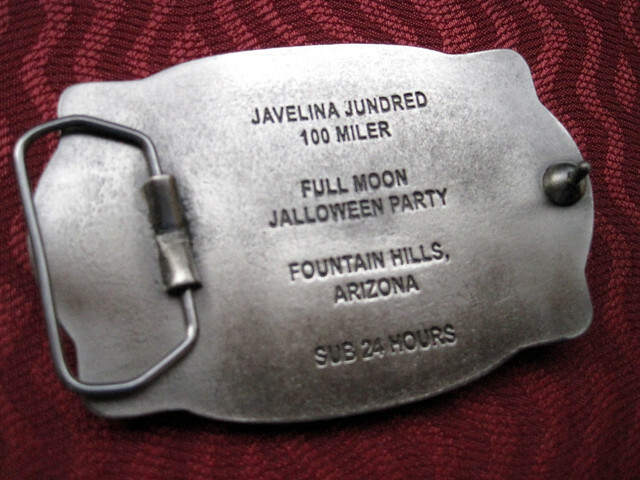 Javelina is a great event to work because the runners come to you and you have the company of all the other crew and spectators instead of being strung out along a course. 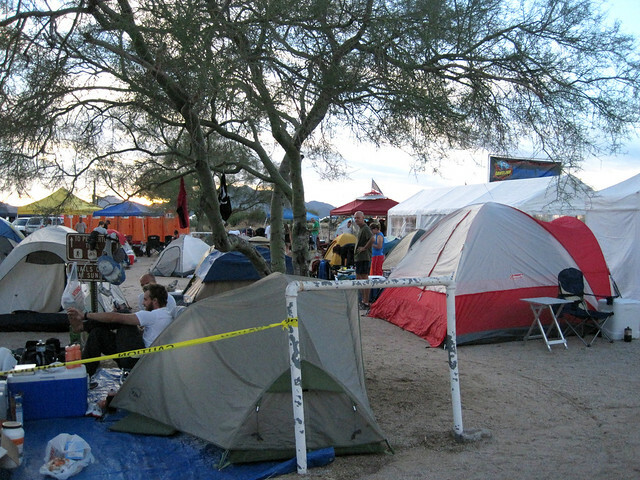 People are allowed to camp at the start/finish area so there is a little tent city which makes it feel cozy. There are also showers and bathroom facilities on site in addition to the porta potties provided. Erika with early leader, Josh Brimhall, in the background. Eventual first female, course record holder, Jamie Donaldson heading out for lap 3. 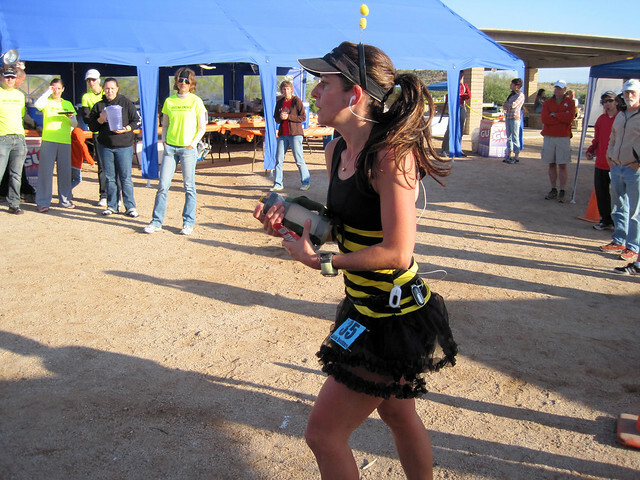 Arizona local PJ; Tony and her shared a couple of the first laps together as they did back in their first Javelina in 08. G.A.C's Chris Pulick, taking his nutrition on the go. I hear Hula music. Tammy Massie finishing up loop 2. 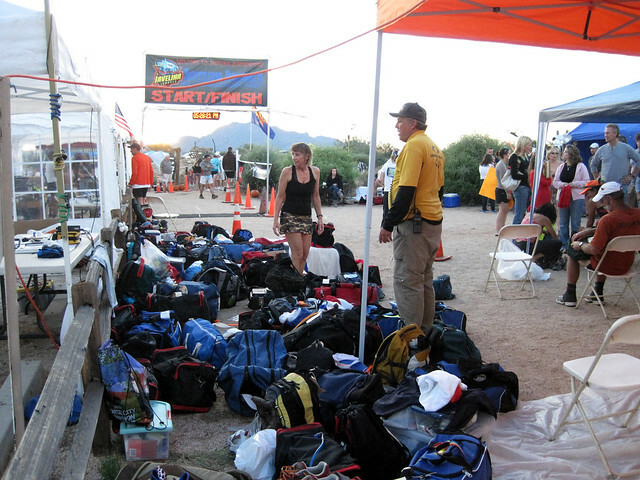 A look at the start/finish area and all the drop bags. Campgrounds behind the start/finish area. Tony comes in with his buddy Eric Gelber. They stick around for about ten minutes eating and drinking and we left when the clock struck 13 hours (7 PM). 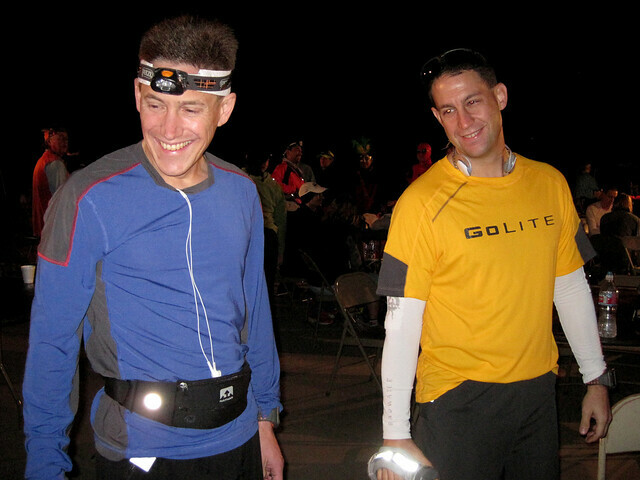 Tony communicated that he wanted to finish with Eric and he didn't care about the overall time as long as it was in the vicinity of 23:30. By my calculations we had plenty of time and it was not a problem. Between the two of them Eric was the one feeling the most tired so we kept it at his pace. He would take a turn for the worst however. He complained of a burning sensation when he urinated, the color was dark and he started to have back pain - all very bad signs. Tony and I kept him in between us so he wouldn't fall behind but by mile 72 or so we were walking and he was still falling behind. We had a talk with him about his symptoms and we all agreed he should seek medical help before attempting loop 6. I was worried. I kept thinking "rhabdo" (Don't know what this is but curious to learn more? 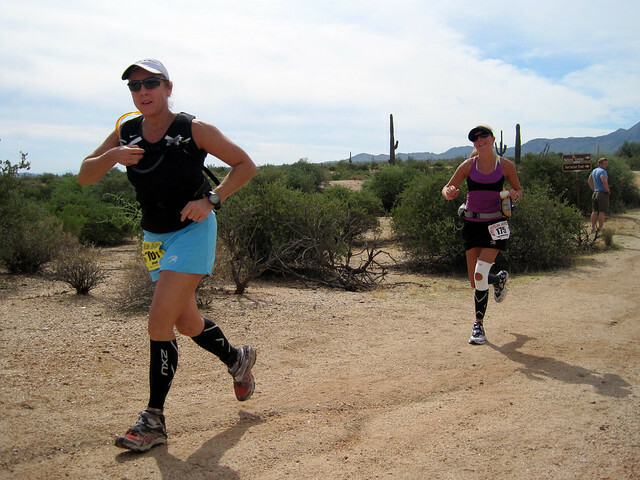 Click here for an informative post on the subject from ultra-marathoning doc Lisa Bliss). Tony was worried too. Eric tried unsuccessfully to wave us off but Tony didn't want to have to explain to his wife Tani why we left him on the trail in his condition. During the day Eric had dehydrated having only had one water bottle. He would finish his 20 ounce bottle not too long after leaving the aid stations and slowly and continously fell behind his hydration despite Tony sharing the contents of his two bottles. One trick in situations like these is to tank up at the aid stations and leave with a full bottle. If a runner drank the contents of a 20 ounce bottle at the station and carried a full bottle out he was actually leaving with 40 ounces of liquids not 20. Anyway loop 5 took us 4 hours and while we were only at 17 hours at this point, things were looking grim for the 23:30 goal. We all talked to medical and the guy was less worried about it than we were. He seemed too relaxed so I made sure he understood our concerns. His diagnosis was that the dark urine and burning sensation was from dehydration and the back pain from hurting kidneys but he was confident that he should be okay with rest and lots of liquids. Seeing that Eric was now in the hands of someone more capable we continued on our way. Eric was not in the condition to make it out with us. It was a bummer indeed. Finally back to running right? Wrong. After a brief spurt of running Tony had issues with shortness of breath. I've had it myself before and I have no idea what triggers it. We had to throw in a lot of walking until he recovered. At the next aid station I gave Tony a couple of Tylenols and a salt tab. He wasn't dehydrated and acetaminophen is supposed to be okay so long as you don't go over the recommended dosage. Slowly he felt better and I could tell by the way he was moving. After another couple of miles Tony got into a groove and laid down a pace that had me sweating and breathing hard just trying to keep up. We got to the next aid station in great time and he launched into another surge shortly after leaving. 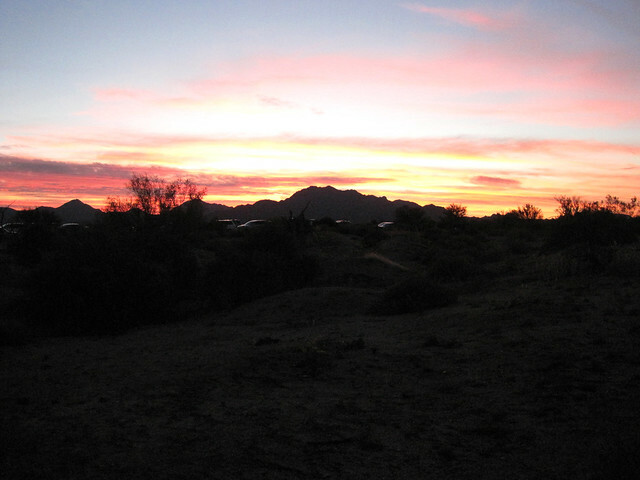 There was no talking, just focused hard efforts, flying past sand and rocks - this is from the guy who wanted me to point out all the large rocks on our first Javelina together. We finish loop 6 in 3:45. We lost a lot of time when he was having his breathing issues but made some of it back with his surges. As we came in Eric was just going back out. He had drank, slept, and felt recovered enough to go back out. He fought his way back into the race and I was amazed. How much mental fortitude does that take? What does it take to go back out knowing you've already blown your goal for a sub-24 finish, knowing that you will be at the back of the pack having to suffer the heat of a second day, going back out with a sore and stiff body having been out for almost 4 hours, knowing that it's probably going to take another 8 hours, and that it will be an effort alone with no pacer? I hope I never find out for myself. When you leave for your last loop you get a glow in the dark necklace so everyone knows you are on the final stretch. There were lots of heartfelt congratulations from the other runners and pacers - I love this community. The climb back to the aid station was at a solid though slower pace. Definitely by this point Tony was hurting all over, the miles taking their toll. 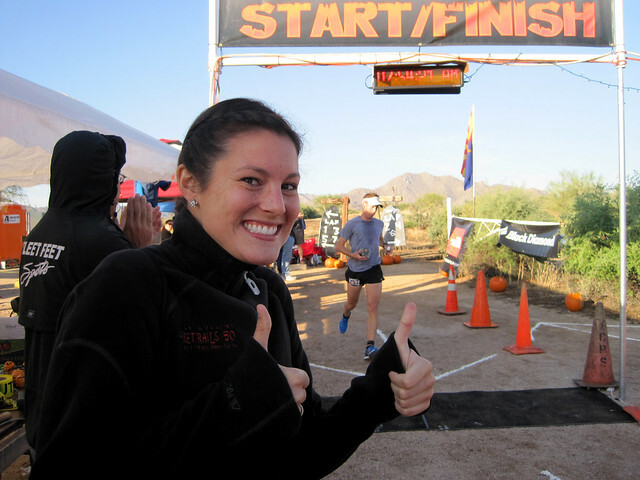 The return to the finish utilizes a piece of trail that is only reserved for the last loop. It's a sweet, smooth, winding dowhill that is about 3.6 miles long and I knew he would feel better once we turn into the trail. Tony asks for a time check when we entered the trail and I had him at 22:20. It was a given that he was going to course PR but I didn't know at the time that he was going to try for a sub-23. If I had known I would have supported him but would not have bet money on it. It was 4.7 miles to the finish and I don't think we went under 10 minutes per mile the previous 36 miles. He unleashed his last and final surge which caught me by surprise and left me in the dust. He just went off like a rocket and at one point I was 30 yards behind. I cursed and chased after him as he charged the entire section of that trail. At the bottom we turned left for the final 1.1 miles to the finish. By this time the clock read 21:46 and thinking it was much further to the finish he slows down thinking he was not going to make it. I saw the sign that said it was only 1.1 miles to the finish so I took the lead and encouraged him to keep going. That last section is made up of small rollers, a pain when you have already traveled 100 miles - the course is actually 101.4. He maked it through with a couple of minutes to spare. Thirty-seven minutes for that last section was awesome and it was probably the fastest miles he'd run the entire race. 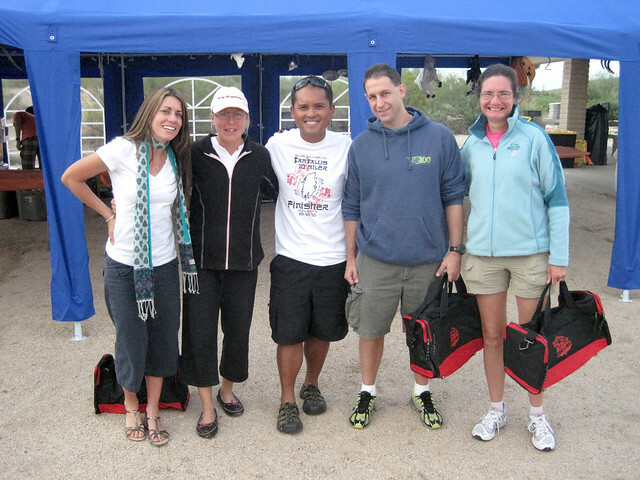 We didn't stay very long at the finish line, just enough to catch up with friends and gather our belongings. We gave Jamie Donaldson a ride and proceeded to the hotel. Jamie and Tony are good friends and spent some time catching up on the days events. After a shower Tony went out to eat with friends. He ate breakfast with his buddy Doug Vaughn, witnessed Eric's finish and proceeded to eat another breakfast with Doug before returning to the hotel. Where he got the extra energy I've no idea. I stayed behind and crashed for 3 hours until he gave me a wake up call. I'm a wuss that way. He also ran the entire race in 8 ounce shoes. I know what 8 ounce shoes feel like, they are light because there isn't a lot of cushion on the bottom. Soon this guy is going to need a faster stronger pacer. I was finally able to make it out to the finish for the final hour of the race and was glad that I did. Always inspiring to see the last ones finish. It was another successful outing for the both of us and we have our work cut out for the next one. I learned a great lesson from the weekend myself - don't mix beer and dessert. I'm sure I'll forget and have to learn it again in the future. Next year may be the year I run it myself but I say that every year. We shall see. 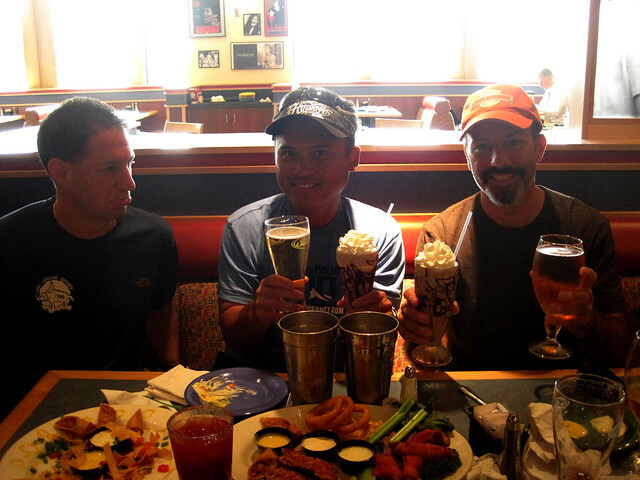 Eric and I with our alcohol and dessert as a jealous Tony looks on. Great write up Rick and awesome work Tony!! Finally got around to reading this. What a great report! I love that buckle and the cast of folk running the race. one of these days I will get out there.